The Sin Bin Sports Blog: Is It Time For Change In San Jose? Is It Time For Change In San Jose? Earlier today, the San Jose Sharks lost to the St. Louis Blues 3-1, and were eliminated from the playoffs in five games. In the beginning of the season, many thought the Sharks would be one of the league's top guns and challenge for the Stanley Cup. Instead they will be getting a little extra time to practice their swing on the golf course this summer. Over the last five seasons, the Sharks have been the big brother of the Western Conference, winning the top spot in the west twice, and winning the Pacific Division four times. They were not as dominate this seas, they finished second in their division, and nearly missed the playoffs, but grabbed seventh place on the last day of the regular season. 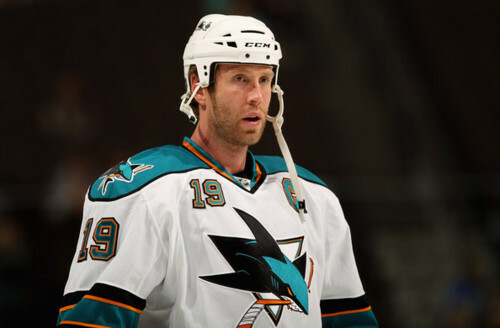 The Sharks' success in the past came thanks to players like Joe Thornton, Joe Pavelski, Patrick Marleu and Dan Boyle who have been apart of this team for quite some time now. However, with the continued shortcomings the Sharks have turned out, is it time for management to change the look of the Sharks? The Sharks have been unable to get over the hump and challenge for the Stanley Cup with the core that they have and may need to shake things up if they want to keep up with the rest of the league. If change is necessary it would be hard to get rid of their big guns due to some heavy cap hits. Thornton, Marleu, Pavelski, and Boyle are all signed through the 2013-2014 season, Thornton, Marleu and Boyle all have cap hits between $6.5 million and $7 million each season while Pavelski carries a $4 million salary. It may be time to say goodbye to a familiar face and bring in some new talent. With Logan Couture developing into a star, this off season may be the right time to say good bye to a veteran and bring in some young talent for the Sharks' future.